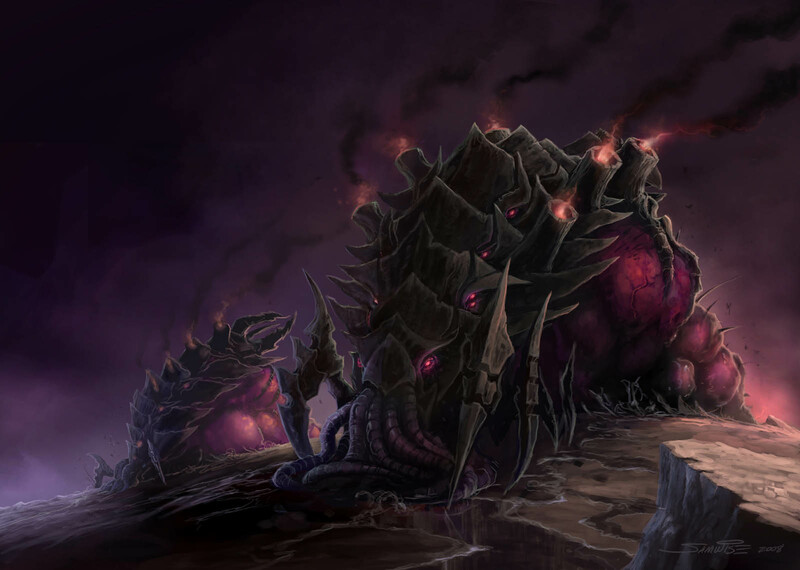 Unlike most Zerg, infestors can travel while burrowed, effectively coming in underneath visual detection (though most advanced sensors can detect their minor seismic vibrations at short range), to erupt from the earth in the midst of enemy defenses and create havoc. They can spit a gob of corrosive slime like the defiler, except that it also rapidly congeals into a sticky and viscous goo which effectively immobilizes victims. It loses cohesion after several seconds, but that can be plenty of time for a swarm of zerglings to finish off the victims. They can also send out a tiny neural parasite, which connects to the base of a biological target's neck and allows the hive-mind to control its actions. Neural Parasite: Affliction (HT-8(2) or Possession (Telecontrol 2)); Range 10/100, Acc 3, RoF 1(5). 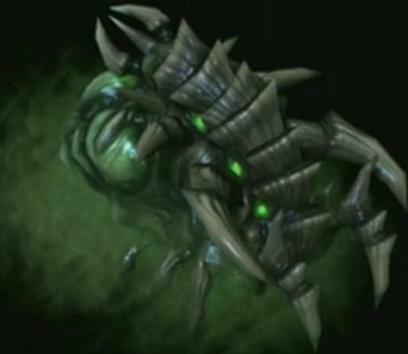 Traits: Zerg; Permeation (Earth, without Finite Thickness); Extra Legs (4 Legs); No Fine Manipulators. 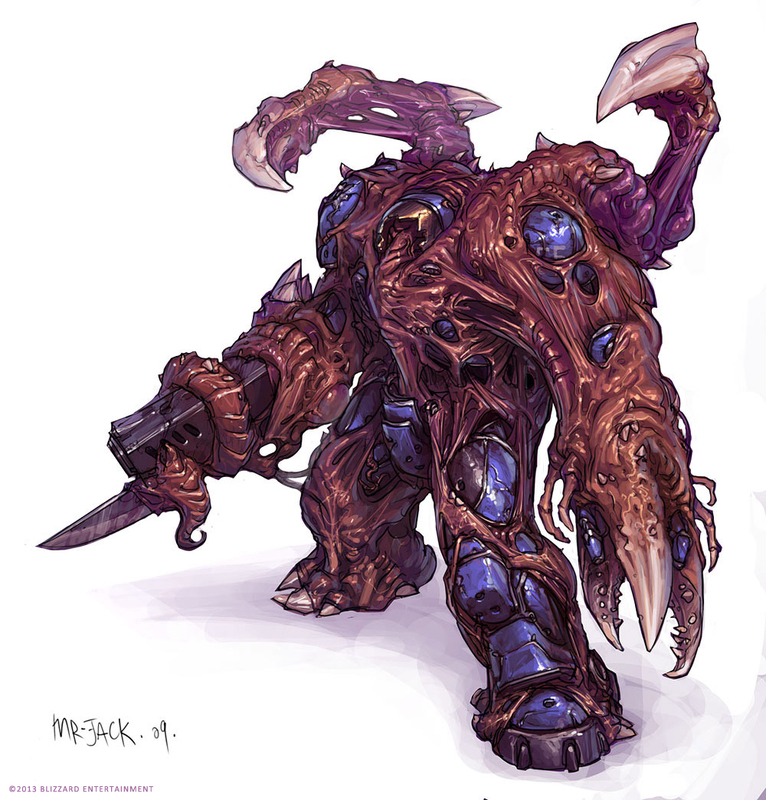 Humans infested with a Zerg assimilation-virus (rather than consumed as bio-mass) retain the ability to use Terran weapons and armor, while their individual personalities and wills are subverted to the hive mind. Terran Weapons (16): by weapon. Skills: Brawling-16; Guns/Gunner (as appropriate)-16; Running-14. A variant of the infestor, and like that breed, able to move while burrowed. It trades the former's hard-setting corrosive slime for more modest acidic spores, and the neural parasite for a mass of grasping tentacles that can lash out several yards to grab an enemy, and draw it into the creature's waiting maw – and that of its swarm-mates. Traits: Zerg; Constriction Attack; Enhanced Move 1 (Ground); Extra Arms 4 (Extra-Flexible, Long 9); Extra Attacks 3; Extra Legs (4 Legs); Permeation (Earth, without Finite Thickness).